Tuesday night was club night. We had two games running and ten guys, including newcomer Deryk, old-timer Guy (plus son Alex) and sorta newcomer Taylor. We could have used another game but such is how it goes! After a quick re-read of the rules after work, I brought out Commands& Colors Tricorne for a first go. 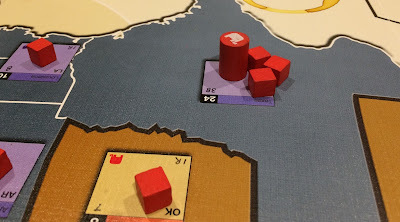 We played Blemis Heights (the intro scenario) twice as we got a feel for the rules and the differences. The board was bigger: no conclusions about the effect of the extra depth but we did have retreats go all the way to the back of the board. And it was harder to bring reserves to bear. Game 1 saw the British attempt to push on both flanks. 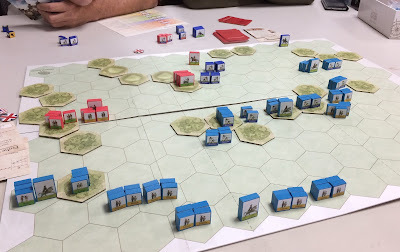 This was not successful (reflecting the lack of combat power that the British had). 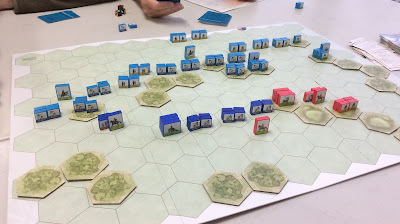 The Hessian grenadiers were pretty successful on the left flank (especially after being reinforced). 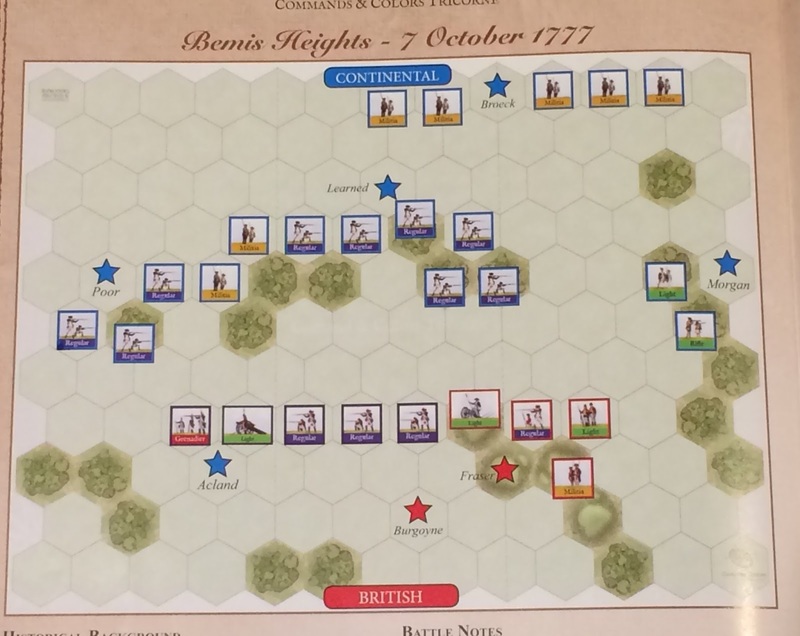 But the Americans moved their line up and basically broke the British into pieces and attritted them through rally failures. 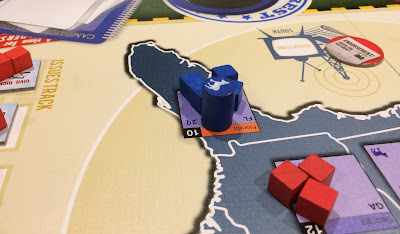 This was a good manipulation of the rally mechanics by the Americans and the rally mechanic was a high point of the first few games. The Americans also aggressively used their combat cards. After a 7-4 American win, we reset and switched. This time the Americans refused the left flank and aggressively attacked on the right and then the centre (learning from the last game). 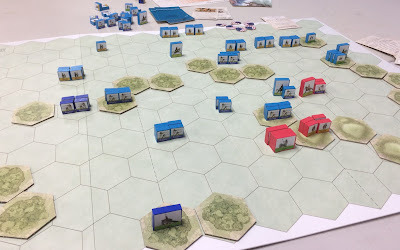 This, combined with terrible dice by the British, was pretty successful and picked the Brits apart again. I wonder (in retrospect) if both sides should use their commanders a bit differently and if that would help the British be more competitive? Again, 7-3 Americans. I look forward to trying a more complex scenario. 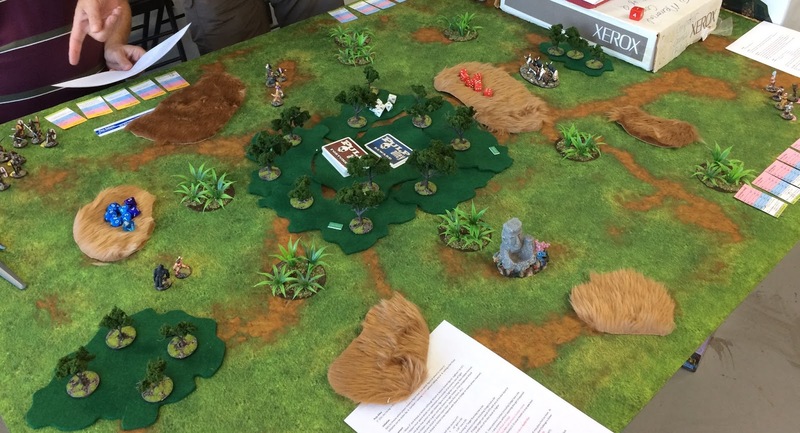 Chen and Taylor played two games of Dragon Rampant. 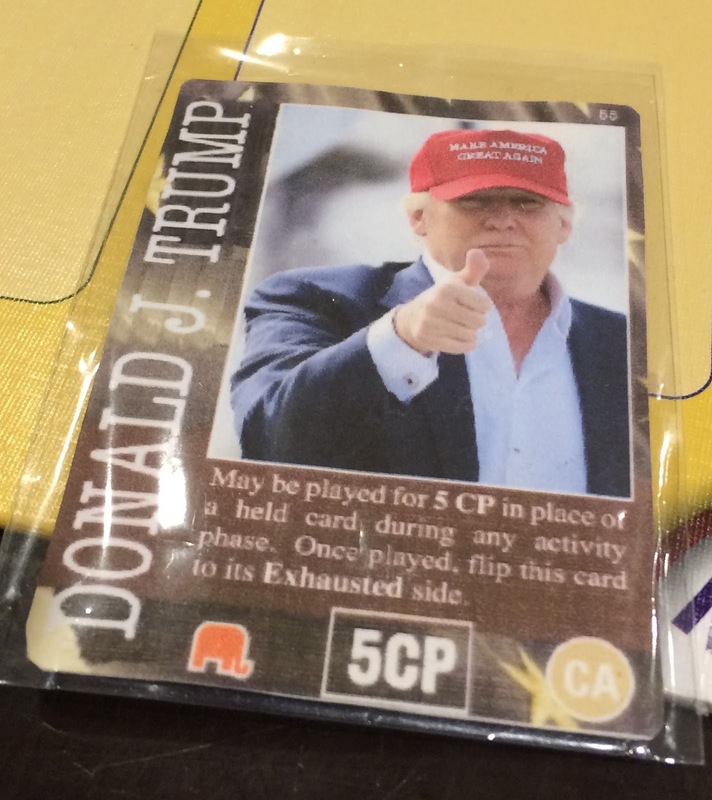 About the only thing I recall was Chen rolling an astounding nine 1's with 12 dice! Yikes! We had room for more games even though there were lots of other guys there. Thanks again to Red Claw for hosting our group. I think this was close to the opening set-up with the Donald in red and Hillary in blue. There are four or five rounds of campaigning, then a debate, then a few more rounds before election day. Bruce had played more recently and Hillary had a much better strategy (staying ahead on the issues, getting media endorsements, and prepping for the debate). 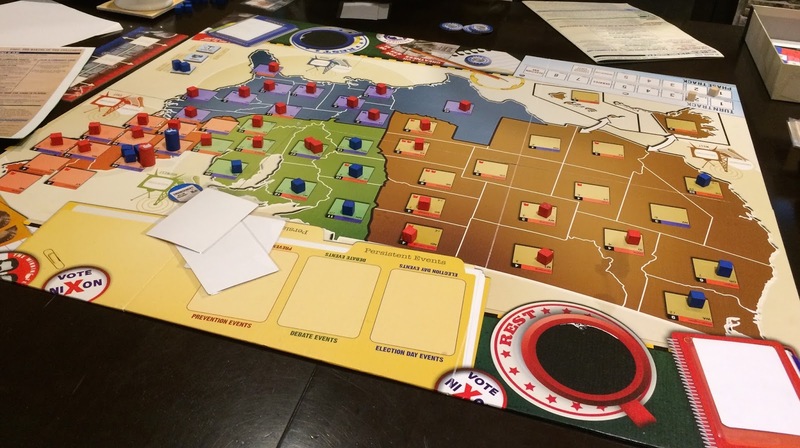 Donald concentrated on the ground game and locking up the south and the fly-over states. The redistribution of electoral votes made for an interesting change from the base game. We both fought for California, Texas and Florida. Hillary did a good job in the end of getting all of these states as well as the northeast. I managed to win the debate but Hillary really impeded my campaigning towards the end. Election day was a total crap shoot, with a few unexpected block draws giving Donald key rustbelt states and, in the end, denying Hillary enough seats to win. Overall, a fun re-skin of Election 1960 that I would totally play again. 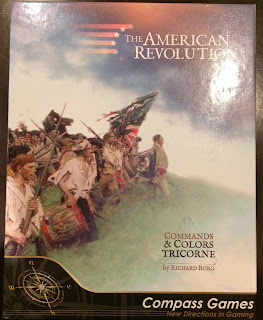 So, after more than a year of waiting, my copy of Commands and Colors Tricorne arrived last week! Great service by The Sentry Box. The box is pretty thick (maybe the thickest of the CCA boxes) and I was excited to open it. Inside you find the usual stuff. Bags of blocks. 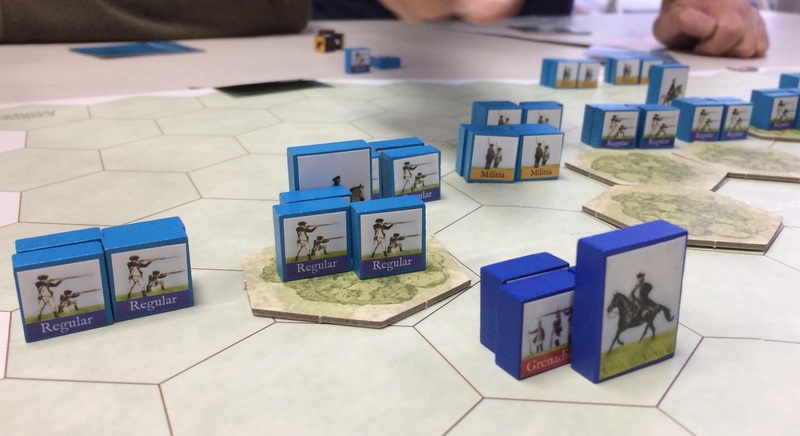 Red British, blue continentals, and dark blue Hessians. Stickering the blocks took about two hours. 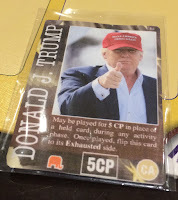 There are also two types of cards: a shared command deck and separate battle cards. I think this mechanic is from the WW1 variant and adds some chrome to combat. 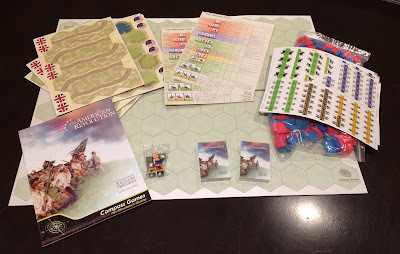 Combat is pretty straight forward but the new mechanics are rally rules. Basically, if you get pushed back, your unit must dice to avoid a rout. So avoiding flags through linear tactics seems important. 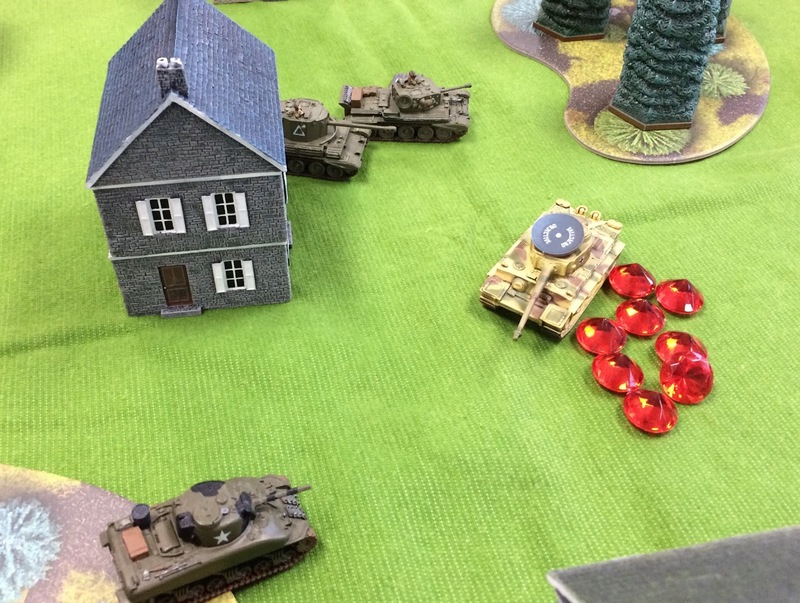 Generals also appear to play a more important role in combat. The rest of the components are nice. Good dice (no stickers!) are included. The may itself is 13x11 hexes (versus the usual 13x9). I will need to see what my hex mats look like downstairs to find one to work with the 54mm guys I have been painting. 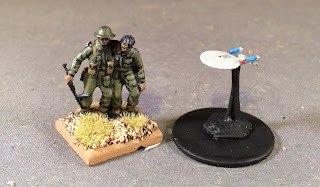 Speaking of figures, I finished off 12 54mm plastic troops that have been sitting on the paint table for months. They are a bit same-same n their colour schemes but, when mixed in with other groups I have painted with different palettes, we should get a more "rabble" look overall. Only regret is the electric blue jacket below right. I have more (sigh) of the rabble to paint. We'll see what I have to do to fill out some of the scenarios. 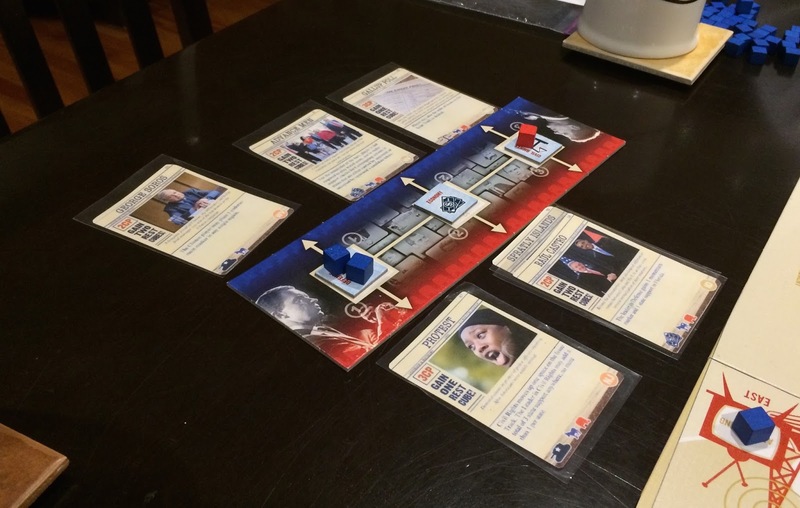 Bruce is coming over tonight to get in a game of Election 1960 but with a Trump-Clinton skin. I am looking forward to see what he has. I'd also like to get in a game of CCAWI in the next few days so I know what I'm doing at the club next time. 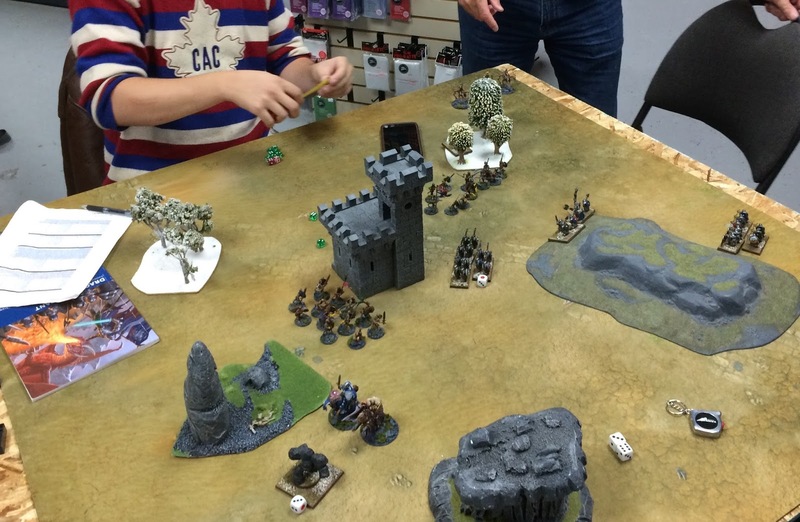 We had our first club night at our new venue (Red Claw Gaming) on Tuesday. There were nine guys from our club out with three games running. There were also maybe 12 other guys with four other games running. By the time I left, it was really hopping, which was nice to see. 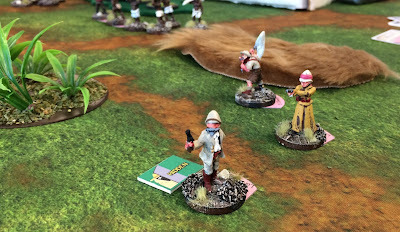 Bruce playtested a Pulp Alley darkest Africa game he will be running at Fallcon for Terry, Jonathan and me. Four factions, each seeking a legendary bird. Minor lot points had to be dispensed with first, though. These included meeting Tarzan (which Jonathan did). Bruce and Terry contested to capture some cattle. Terry employed his baggage handlers as meat shields and managed to drive Bruce off. 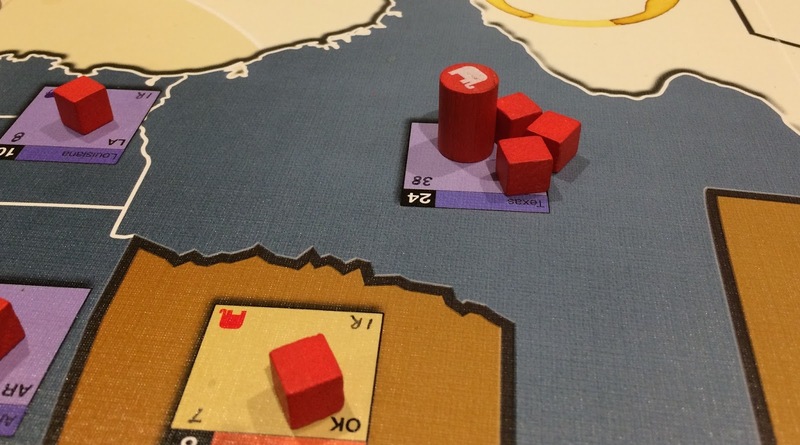 The use of gangs was an interesting mechanic that I had not seen before. Terry's English explorers included a fellow armed with a butterfly net. 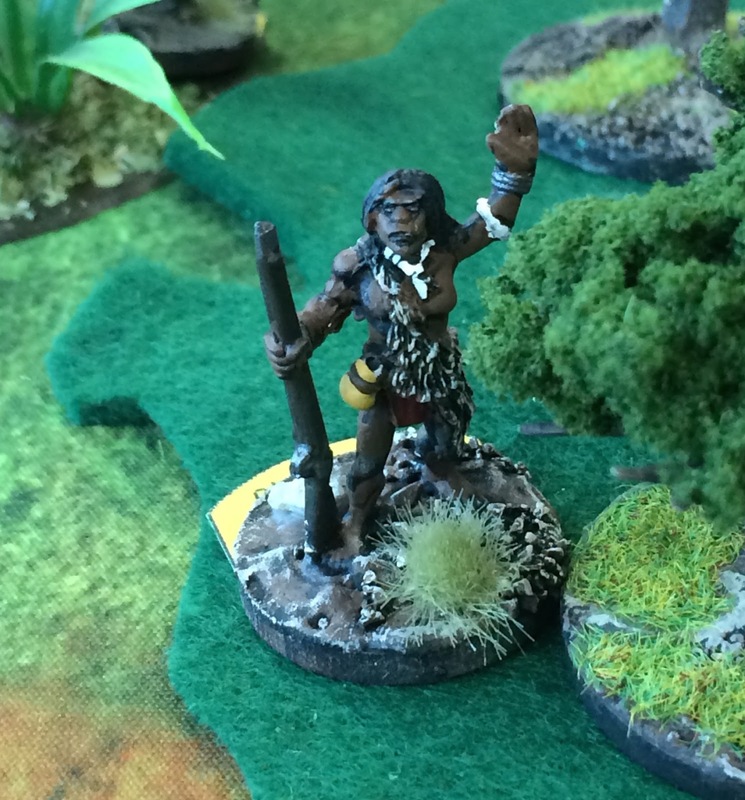 As the game heated up, we saw the more powerful characters come into play, including Jonathan's tribal leader. In the end, Terry won, making a run on the final objective just ahead of when I was going to do so. Bruce and Jonathan were also about to win so it was a very close game. 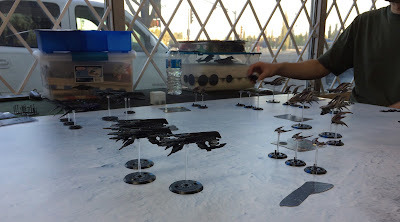 Chen and Scott played some Dropfleet Commander while Dave P ran a game of Tanks! 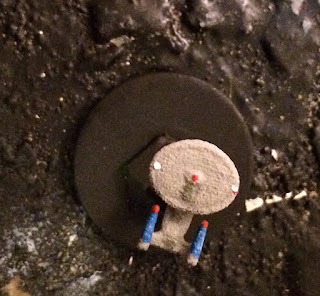 Up next: I have some 54mm AWI troops that I just need to finish the base on. I also have a bunch of old Star Wars figures I need to finish basing. And then maybe onto some Star Trek ships. 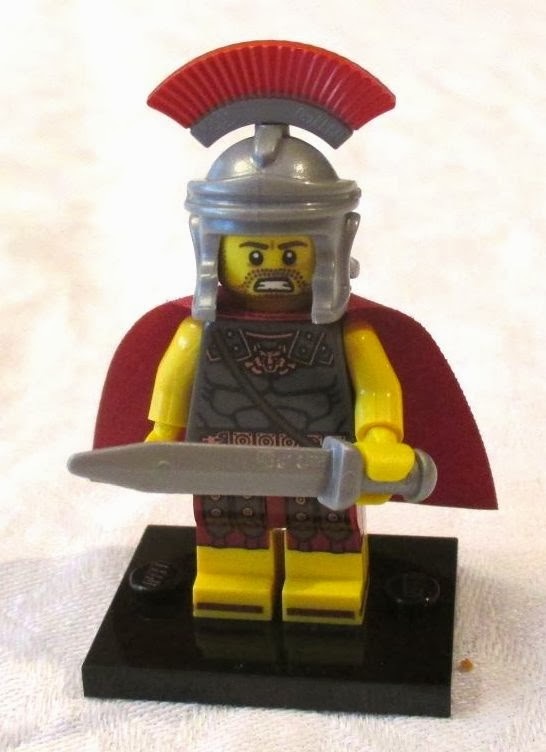 I'm also looking forward to the arrival of Tricorne and Vikings. I'm slowly getting back into gaming and painting as summer wanes into autumn (sigh). I have some larger 54mm figures just about done as I await Tricorne's arrival in Canada. Above are some 20mm figures (painted by Tim in Saskatoon) for scale. Even getting a picture is a challenge--to say nothing is trying to figure out how to paint them! 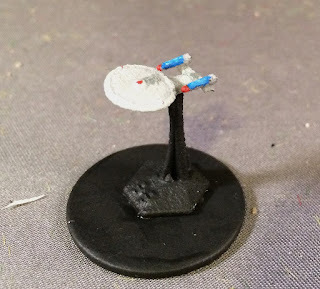 So far the Feds are getting a washer of grey, then some lighter grey to pick out plating details, and some some brighter colours on the nacelles. I see (below) that the white I used to navigation lights is too bright (maybe yellow?). No rules set picked out yet. Maybe I'll try to write something where the operational unit is a squadron. 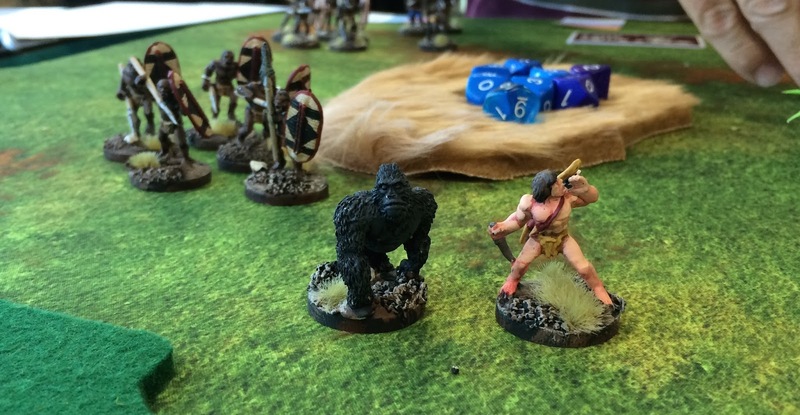 This week is also our first club night at Red Claw (I'm pumped to actually game again!). And my copy of Vikings should be in the mail soon.